The remote Auckland Islands 370 km south of Stewart Island are tiny specks of land in the middle of a vast ocean. This makes them important breeding grounds for many species of seabirds and seals that forage in surrounding seas. Bird experts Colin Miskelly and Alan Tennyson visited the islands in late January, and here they document some of the extraordinary diversity of seabirds that breed on these little-known islands. The Auckland Islands are the largest and most diverse of New Zealand’s subantarctic island groups, with more than a dozen islands scattered over 50 km north to south. Several of the smaller islands formerly held populations of farm stock, rabbits, and mice, but the only introduced mammals remaining in the group are feral pigs, cats, and mice on the 50,990 hectare main island. The Department of Conservation is in the early stages of planning eradication of these predators. 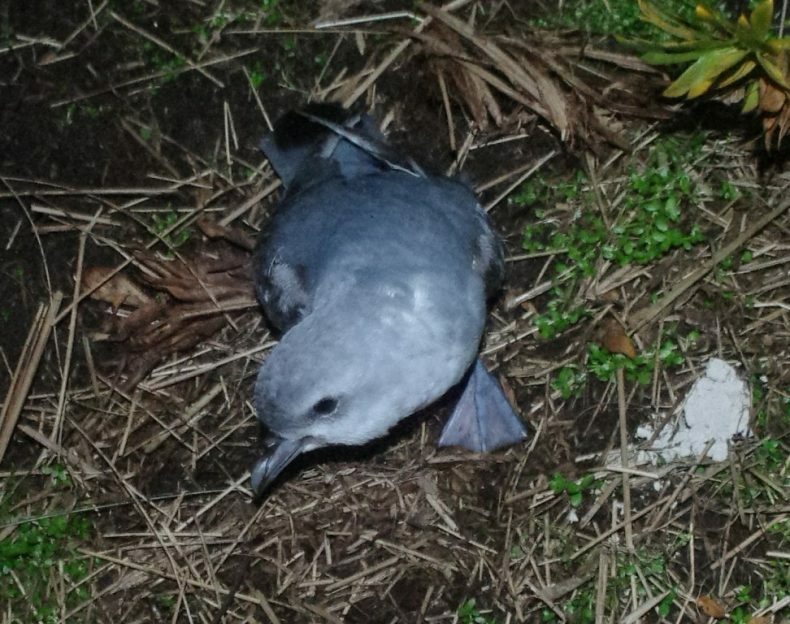 Our research focussed on species likely to benefit from their eradication, including burrow-nesting petrels. We undertook seabird surveys on 14 islands within the Auckland Islands during our visit, from islets less than a hectare in size up to the northern headlands of the main island. This included all the islands within Port Ross at the northern end of the group, and three islands within Carnley Harbour in the south. 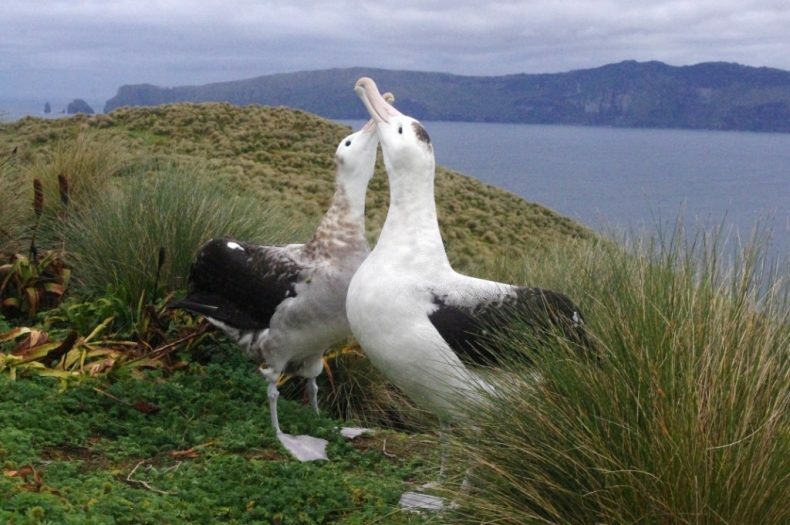 Several of the seabirds that breed on the Auckland Islands are large, spectacular species, including albatrosses, penguins, and shags, which attract the attention of ecotourists and conservation managers. 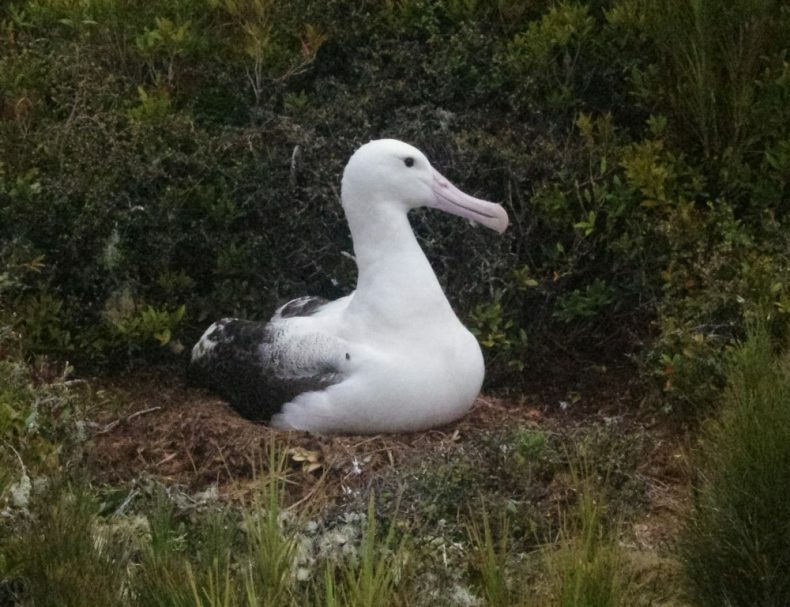 Many albatross species suffer high levels of incidental mortality in commercial fisheries, and as a result two of the four species that breed on the Auckland Islands have been the focus of efforts to monitor population changes and determine causes of mortality. Most of this work has been done on Adams Island (the southernmost island, and not part of our survey) and on Disappointment Island off the west coast of the main island. The southern royal albatross is the largest albatross species, equalled only in size by some populations of wandering albatross. Its largest population is on Campbell Island (a day’s sailing south-east of the Auckland Islands), but there is a small population on 710 hectare Enderby Island, the northernmost island in the Auckland Islands. Gibson’s albatross (a form of wandering albatross) is only slightly smaller than the southern royal albatross, and breeds only on the Auckland Islands. Pig predation on the main island means that they now breed only on Adams Island and Disappointment Island. White-capped mollymawks have their world stronghold on Disappointment Island, with smaller colonies on Adams Island and at South-west Cape on the main island. Pig predation is a major problem at the South-west Cape colony, where most of the remaining nests are now on steep, inaccessible ledges. 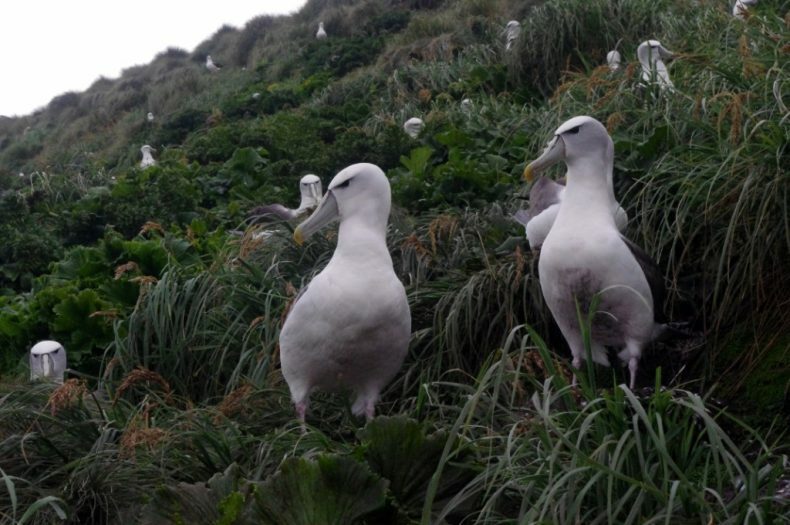 The remaining albatross species that breeds on the Auckland Islands is the light-mantled sooty albatross, an elegant species that breeds as scattered pairs and small colonies on cliff ledge sites around most of the group. We were surprised to find two small downy chicks at a site accessible to pigs and cats on the main island, and fear that they have little chance of surviving the long nestling period. 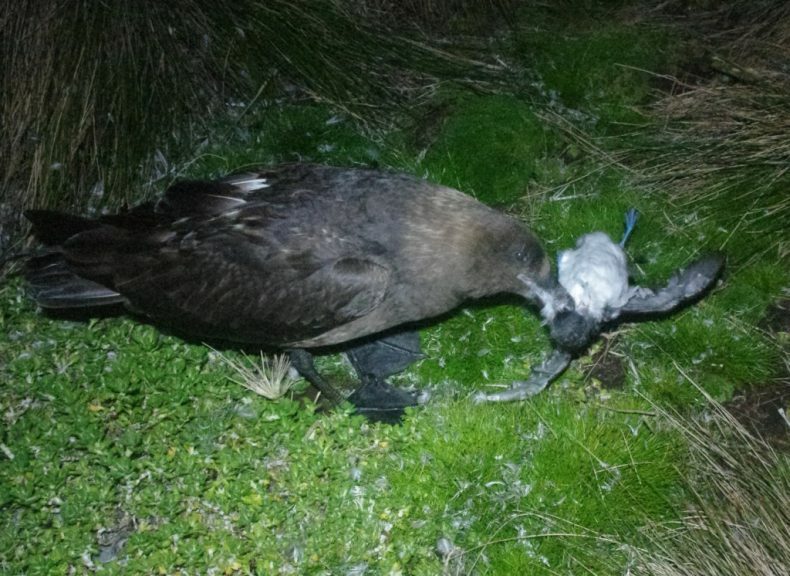 Along with the albatross species, two other large species that breed on the Auckland Islands also suffer high mortality in fisheries – the northern giant petrel and the white-chinned petrel – and have been the focus of recent survey effort to determine population sizes and trends. Giant petrels have a well-earned reputation as vultures of the sea, congregating around dead whales and seals, as well as around fishing boats cleaning or retrieving their catch. 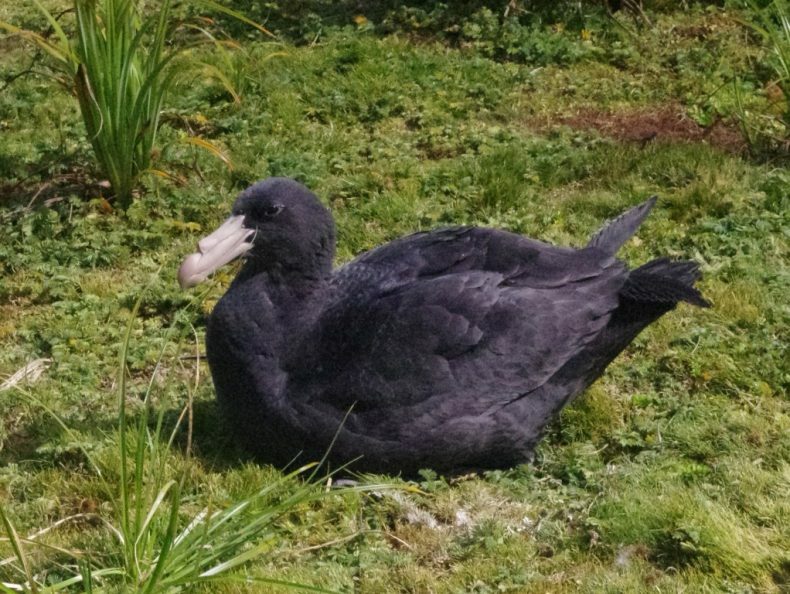 Adult northern giant petrels are very shy on their breeding grounds, probably as a result of generations of persecution by fishers and other seafarers throughout the southern oceans. Their alternative names of stinker and stinkpot hint at how they have been regarded over the years. We found fully-grown young ready to fledge on six of the islands we surveyed (Disappointment, Enderby, Ewing, Ocean, Frenchs and Dundas Islands). 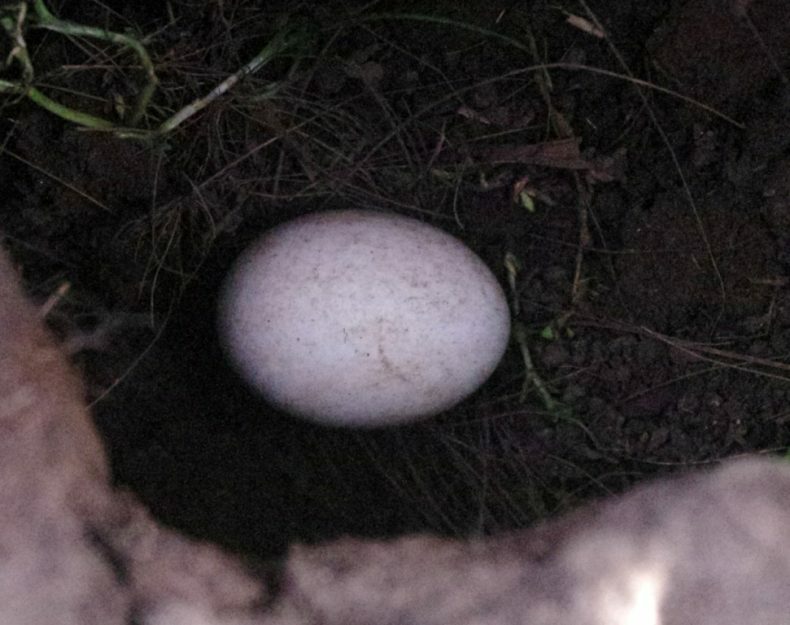 The white-chinned petrel is the largest of the burrow-nesting petrels, and has correspondingly large burrow entrances that are typically found in very wet and muddy sites. 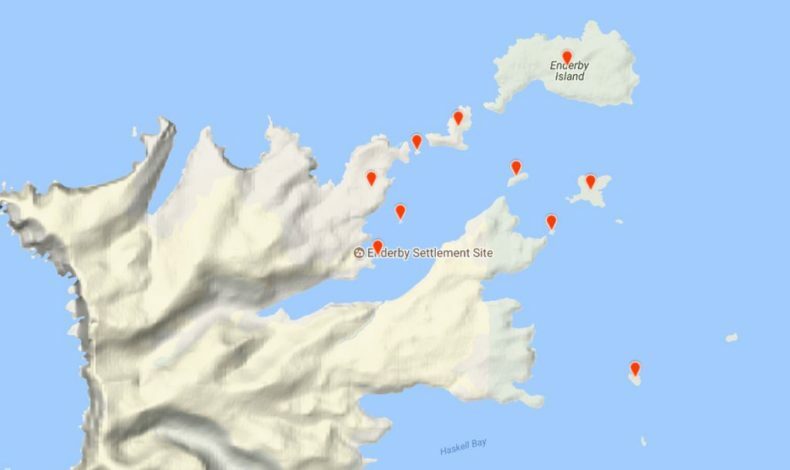 We found them breeding in a large, noisy colony on Disappointment Island, and in smaller numbers on Monumental and Ewing Islands, with a couple of isolated burrows on Enderby Island. All of the smaller petrels visit their breeding colonies at night to reduce the risk of predation by skuas, falcons and gulls. The next down in size are the white-headed petrel and sooty shearwater, both of which are similar in size to a large gull. 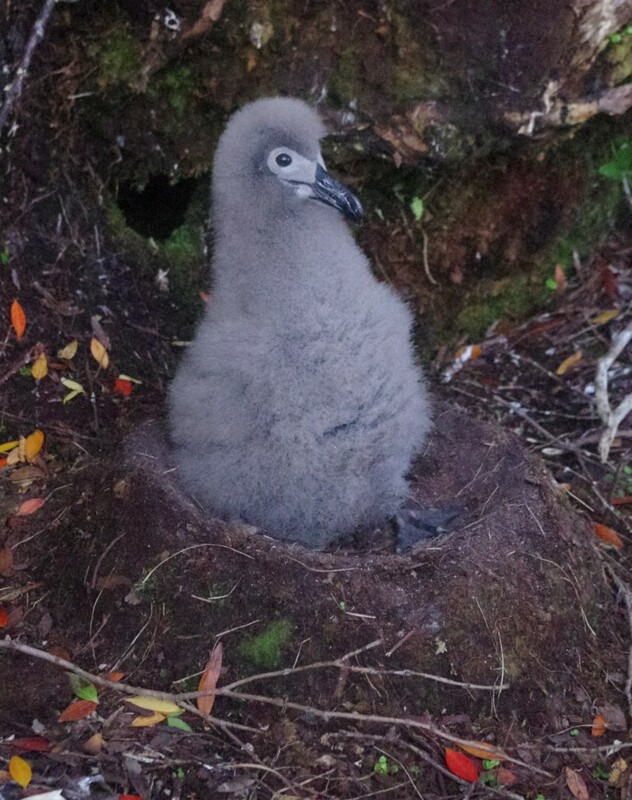 We found white-headed petrels breeding on 12 different islands, with an enormous colony on Disappointment Island. Sooty shearwaters were generally less abundant, although there were often large flocks (several thousand birds) feeding in Carnley Harbour. 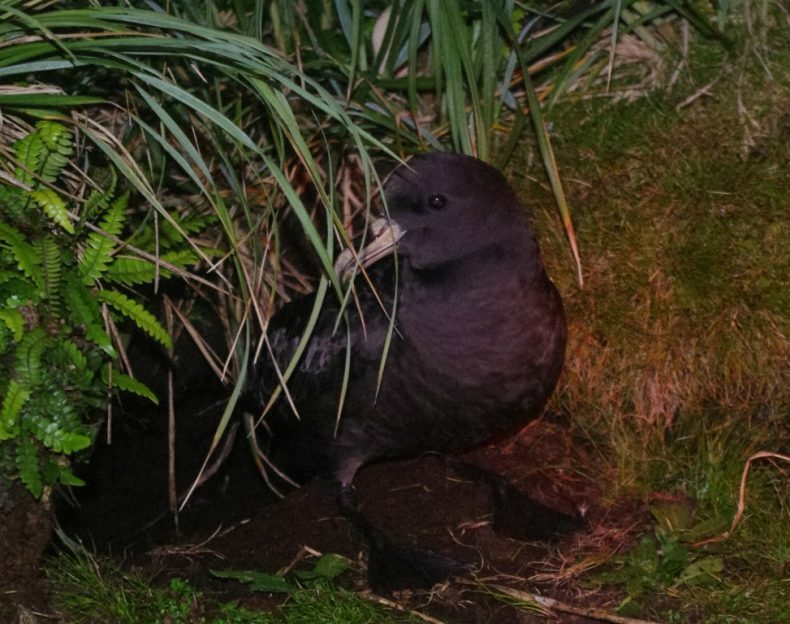 The smaller petrels (including prions, diving petrels and storm petrels) are much more difficult to survey, as their small burrow entrances are harder to detect (particularly under tussock and sedge) and even when burrows are found it is not obvious which species they belong to. 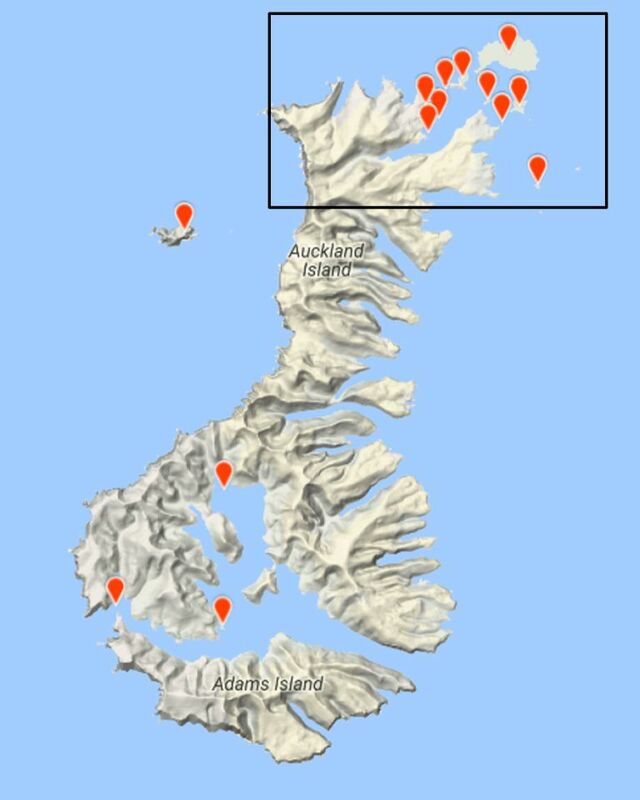 Antarctic prions are common in large feeding flocks in Port Ross, but we found breeding colonies on only two small islands (Shoe and Davis Islands). They formerly bred in large numbers on the main island, where hundreds of cat-killed birds were noted in the 1970s. We failed to find any sign of prions or their burrows on the main island. 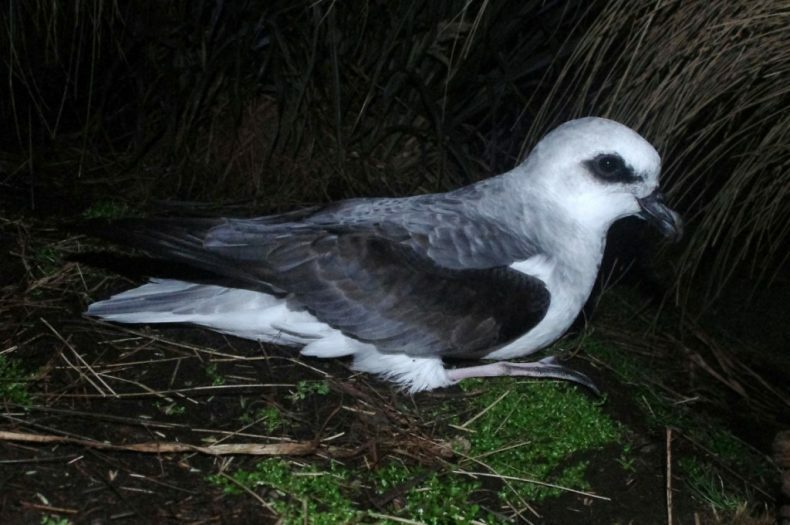 The similar-looking lesser fulmar prion is one of New Zealand’s least known birds. We found them breeding on Ewing and Disappointment Islands (the latter a new record). However, our visit was a bit too late, catching only the last few stragglers in otherwise deserted breeding colonies. Another highlight of our visit was finding nests of black-bellied storm petrels on Rose and Enderby Islands. 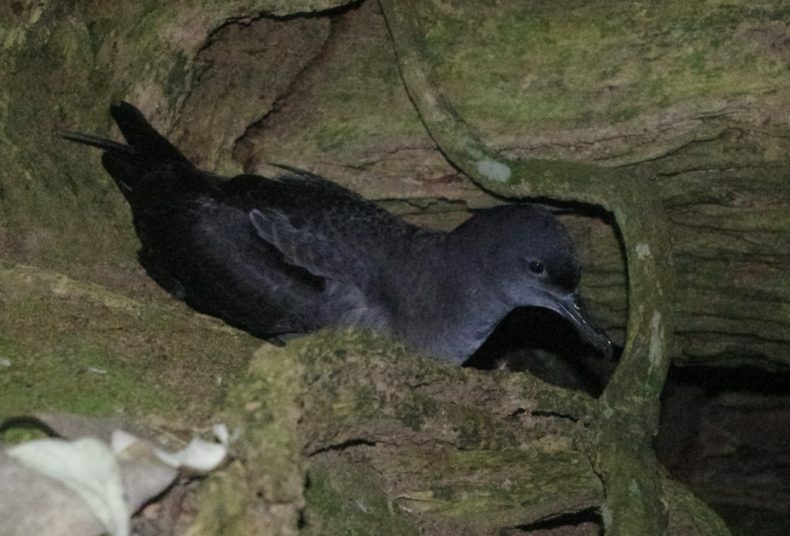 The only previous confirmed nests of black-bellied storm petrels in New Zealand were two nests on Adams Island in 1929. Based on the number of birds that we saw ashore, it is likely that Disappointment and Ewing Islands also hold large black-bellied storm petrel colonies. 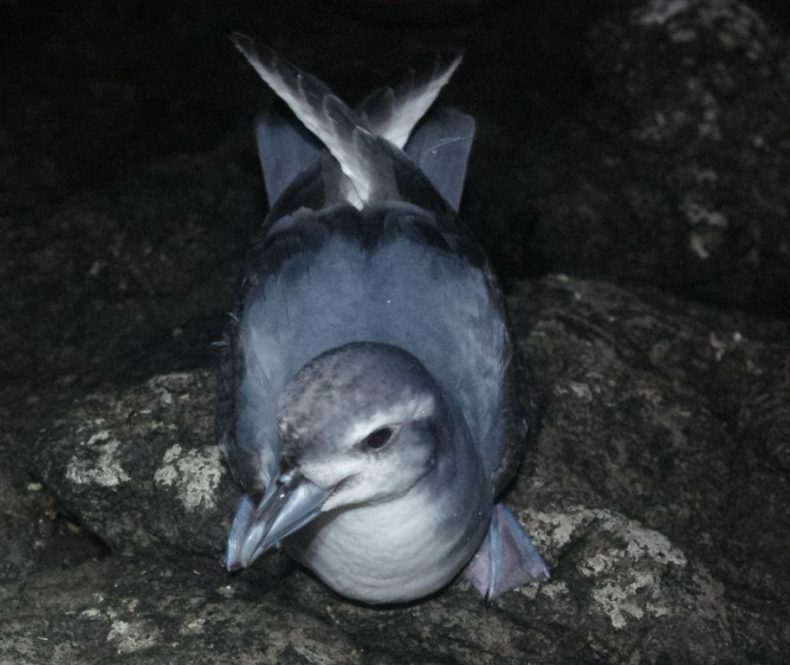 We saw grey-backed storm petrels in our spot-light beams on Disappointment, Ewing, Enderby, Ocean and Shoe Islands, but the nests of this tiny seabird are notoriously difficult to find. Common diving petrels were found on many of the less modified islands, and were particularly abundant on Disappointment, Ewing, Ocean and Shoe Islands. Overall, our survey found that petrel colonies were most diverse and abundant on islands that had never had introduced predators or browsers (including Disappointment, Ewing and Shoe Islands). Petrel diversity was also high but their abundance low on islands where browsing mammals and/or mice had been eradicated or had died out (Enderby, Rose and Ocean Islands). The contrast between all these islands and the main island was stark. Despite vast areas of suitable habitat, the main island has few breeding seabirds, pig feeding sign was everywhere, and cat droppings were found along one inland route. 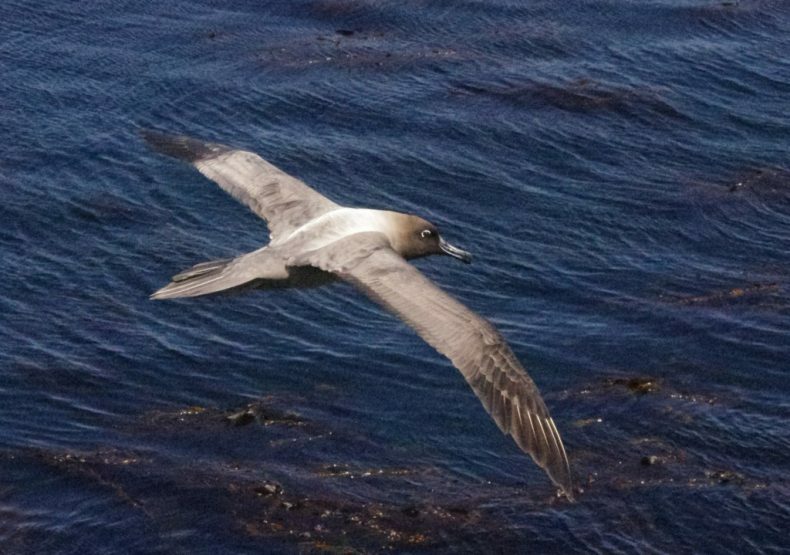 The presence of these predators on the island for nearly two centuries has been devastating for albatrosses and petrels, along with numerous other endemic and native bird species. With many thanks to the Department of Conservation and the crew of Evohe for supporting our survey work. Excellent work Colin & Alan, it’s great to know the breeding distribution of the seabirds & the impact of predators. 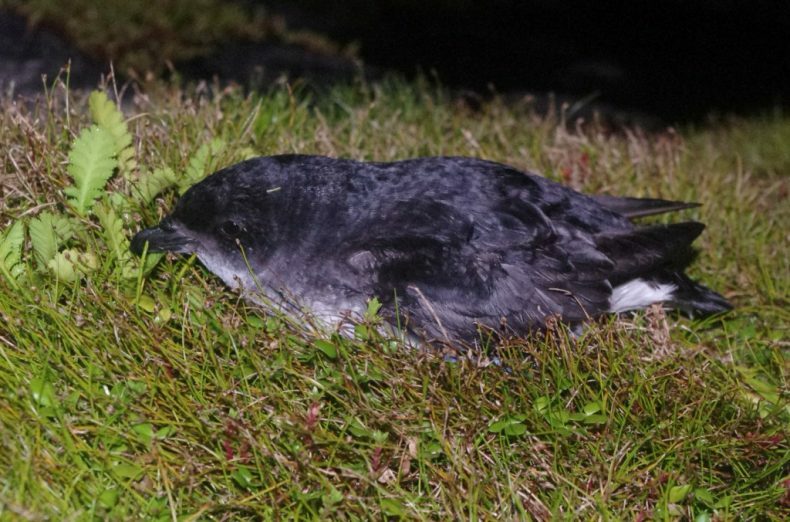 Do you know if there are any Cape Petrels breeding on the Auckland Islands. The only confirmed breeding site for Cape petrels at the Auckland Islands is Beacon Rock, although they probably breed on nearby Compadre Rock. Both these rock stacks lie close to the north-west coast of Auckland Island, near the entrance to North Harbour. The closest that we approached this area was about 3 km off shore en route to Disappointment Island, unfortunately too distant to confirm whether Cape petrels were occupying breeding sites on either stack. Cape petrels were common among the large flocks of Antarctic prions feeding on krill at the eastern entrance to Port Ross, but these may have come from the much larger Cape petrel breeding colonies on the Snares Islands 275 km to the north. I am sure many of us wish you every success in raising the necessary finance. Thanks very much Grahame. We can all play our part making sure that government and other potential funders keep this high on their priority list. Can the Predator Free NZ pledge be extended to these special islands? I hope so! good luck for your future endeavours! Predator Free 2050 has four ‘Interim 2025 goals’, with the third of these goals being “Removing all mammalian predators from offshore island Nature Reserves”. This specifically includes attempting to eradicate pigs, cats and mice from Auckland Island. Rather sad. Is there to be any action taken on your findings? Thanks for you comment Olwen. DOC are working on a pig + cat + mouse eradication proposal for Auckland Island, which of course will need financial support from government and/or philanthropists. 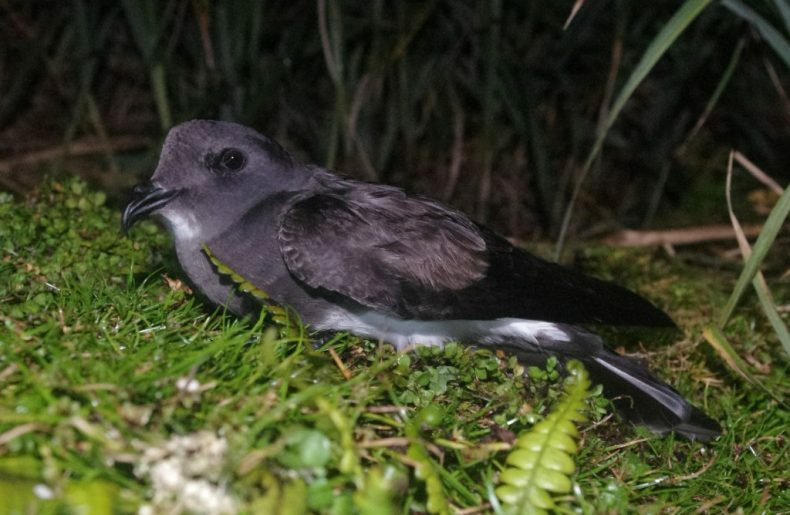 If successful it will be one of the biggest gains for seabird conservation ever achieved globally, plus will benefit most of the other special birds, invertebrates and plants of the Auckland Islands, including Auckland Island rail, snipe and teal. Unfortunately more than a century too late for the merganser.